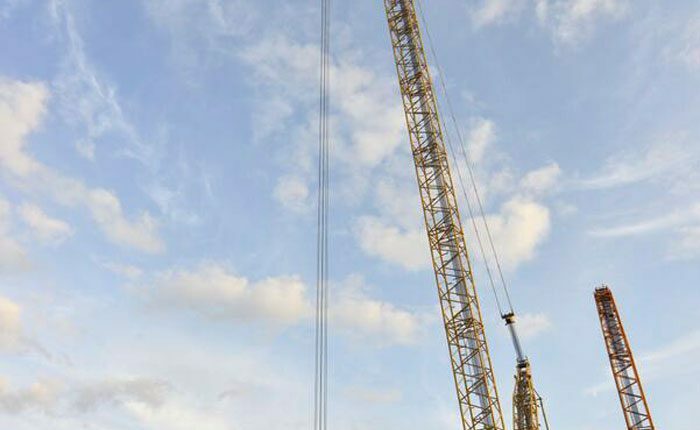 Following the successful market launch of the Boom Booster kit for the Terex 8800-1 crawler crane, Terex Cranes is now offering a Boom Booster for the Superlift 3800. It increases the main boom’s stiffness, boosting the crane’s lifting capacity by up to 30%, according to Terex. Kits for Superlift 3800 cranes are available in lengths of 24 to 84 meters. The welded-steel structure consists of up to seven sections with a length of 12 m, comes standard with the Terex fall-protection system, and is designed for being directly mounted on the crane. When equipped with the Boom Booster kit, the Superlift 3800 crane can reach a maximum hook height of 174 m and lift loads of up to 80 tonnes. The Boom Booster kit enables the crane to handle lifts in the 750-tonne class, making it suitable to erecting large wind turbines, which usually require lifting heights of more than 140 meters. Terex Cranes has developed an entire series of innovative solutions designed to provide cost-effective use of the Boom Booster kit. For example, the structure has an overall width of only 3.5 m making it easy to transport. Two additional boom sections can “slide” into the kit during transportation, eliminating the need for at least one truck and saving up to 1,000 euros, depending on the configuration. Another highlight is the optionally available Superlift Split Tray with quick-coupling technology, which can be used when setting up the main boom with or without the Boom Booster kit: Once the main boom is set up, the counterweight that is no longer required can easily be uncoupled, and the crane can move with only the Superlift counterweight. The Split Tray reduces the amount of assembly time and personnel required, and eliminates the need for an assist crane, potentially reducing costs by up to 10,000 euros per lift, according to calculations by Terex. In addition, a 3.5 m long extension for the Superlift mast increases the radius from 19 to 21 m, and allows lifting off long-boom systems from the ground without an assist crane. Finally, the optional Flex Frame solution, which replaces the usual tele-cylinder, allows easy setting of the Superlift counterweight radius from 13 to 21 m with full counterweight on the tray. This reduces the need of restacking counterweight, saving valuable time. All three options – Superlift mast extension, Split Tray and Flex Frame – are available separately, but work best in combination to reduce rigging time and the need for an assist crane. When the Superlift 3800 needs to be moved to a neighboring work site, with a mounted adapter frame at the end of the boom, the crane can travel with a boom length of up to 94.5 m. “This saves between four and five hours of disassembly and assembly time total, making another significant contribution to cost-effectiveness,” points out Guntram Jakobs, product marketing manager at Terex Cranes. Terex Cranes also offers a new, higher-capacity double hook block for Superlift 3800 cranes with Boom Booster kits. Together with the crane’s standard hoist 1 and hoist 2, this hook block not only makes it possible to reach a lifting capacity of up to two times 90 tonnes, but also increases the maximum lifting height by yet another 2 m. Another advantage: The use of two winches speeds up the lifting speed by a factor of two. The Boom Booster optional kit is available with all new Superlift 3800 crane orders. It can also be ordered separately as a retrofit kit.